My name is Corey Walker. One of the most incredible things I’ve done on paper is become a NASA intern through the agency’s Student Airborne Research Program, otherwise known as SARP. Why? I grew up in Etowah County, Alabama which has a poverty rate well above the national average. At the end of the year, I will be one of just 8 percent of people from my hometown who will have achieved a bachelor’s degree. I’ve come to recognize that the opportunity I’ve had is somewhat of an anomaly for many who have watched my success. 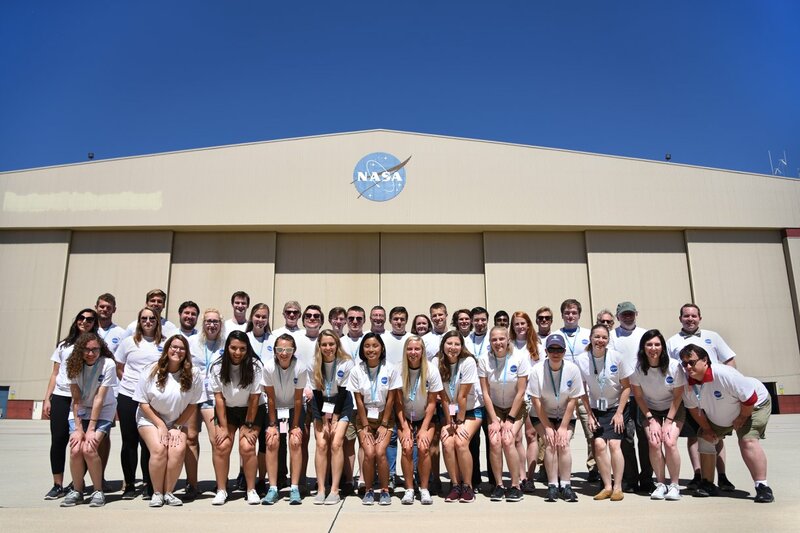 I wanted to participate in this Q&A blog to share my experience with the NASA SARP program and to express my gratitude towards those who have given someone like me a chance to succeed. I also want to encourage the next generation of student scientists to apply for opportunities like SARP to broaden their skill sets and to experience what field research and lab analysis is all about. CW: The conditions that create a NASA intern are variable depending on who you ask. However, for me it begins with ordinary people who have extraordinarily impacted my life. Along the way family, friends, teachers, and mentors have taught me the value of perseverance, working hard, and pushing yourself beyond known limits. CW: The answer to this question lies in the evolution of my interests. For example, when I was a freshman, I was an English major. I applied the skills I learned with my time in the English department to the development of a YouTube channel, which I’ve since neglected. My sophomore year, I changed my major to nursing. While in this major, I applied myself to the rigorous study of science. Through this study, I produced a bit of character development and self-confidence. As science education molded me, I decided to study biology and education as a double major. 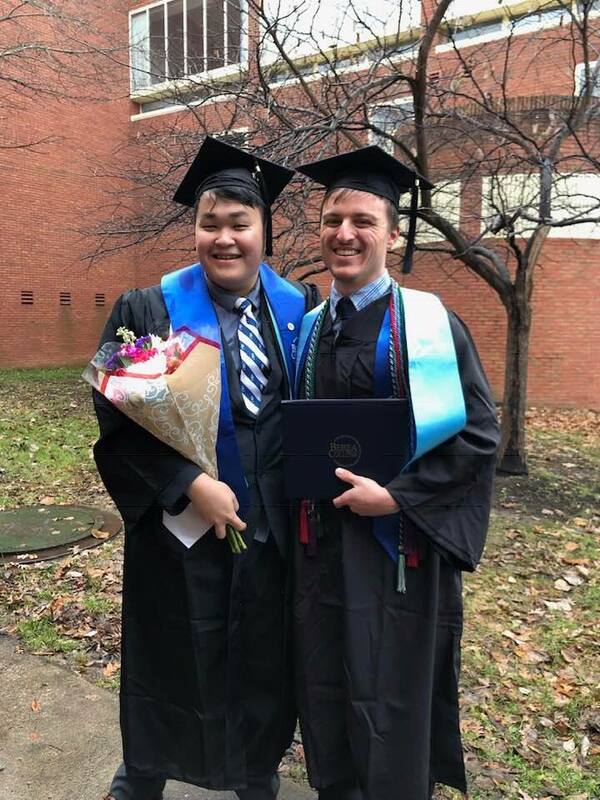 I’m proud to report that I graduated this month. As a future science educator, I want to use my experience in the classroom to leverage curiosity and the understanding of complex systems. I also want to inspire the next generation to apply themselves towards their own challenging, individual goals like the one I achieved by working for NASA. This isn’t the first time you’ve applied with the program. What inspired you to persevere and apply again? CW: I have heard lots of teachers say something cliché like, “You can do anything you set your mind to.” I personally believe in this phrase, first because I am an optimist, and second because I think humans are powerful when they decide to act. However, I think that there is a responsibility that comes with believing this phrase. Personally, I think it would be unfair for me to tell my students to believe in themselves if I first did not believe in me. In a lot of ways, applying to SARP again is just myself modeling for students the act of taking responsibility for my beliefs. I also hope my second application to SARP teaches students an important lesson. Failure is feedback. Why do you think internship opportunities like SARP are important for college students? CW: I came to SARP from a small, liberal arts institution in East-Central Kentucky called Berea College. I am the first SARP alum from my school. The connections I made with this research experience will be extremely valuable to future generations. I intend to help someone else from Berea find the opportunity to work at NASA by connecting them to the network of scientists I have created. I also think opportunities like SARP are a great resume booster. This research experience under my belt will certainly prepare me better for graduate school. What do you think undergraduate students can benefit from most by participating in opportunities like SARP? CW: SARP is interesting because it puts you in an environment where you are forced to learn new things you’ve never thought about studying. As an educator, I am a big proponent of discovering new things. While at SARP, I was introduced to analytical tools and software like ENVI and MATLAB. I even had the opportunity to work with ArcGIS and ArcMap. This made me see a side of science that was utterly new and outside to anything I had ever contemplated. Another thing that is beneficial about SARP is the way you get to be inspired by all kinds of interesting scientists and experiences. Some of my favorite moments were when I got to hold Sherwood Rowland’s Nobel Prize and see a real Mars lander being built at JPL for the 2020 mission. Describe your research project and group. CW: Something I noticed while flying in Southern California was all the tile or red-shingle roofs. This was certainly different from where I grew up and intrigued me. Because of my experiences being a volunteer firefighter with the city of Berea, I began to wonder how defensible red-shingle roofs were compared to wood shingle roofs if exposed to wildfire. This interest, along with help from mentors Alana Ayasse and Dr. Dar Roberts gave me the desire to develop a project where I mapped fire risk using remote sensing instruments. In my project, I successfully mapped materials like non-photosynthetic vegetation (NPV) or dead grass, green vegetation (GV) and soil and road in Goleta. I then compared maps I made to the location of the Holiday Fire, which started on July 11, 2018 and destroyed 28 structures. How did you collect data for your research? CW: I used data taken from NASA’s ER-2 16 days prior to the Holiday Fire. It was important for me to use data that was as close to the fire date as possible. I did this in order to accurately assess what kinds of materials were on the ground before the fire started. CW: Not only did I show that the Holiday Fire occurred in a high fire risk area, but I also found interesting patterns. More specifically, my maps showed high fire risk in areas to the north and south of Goleta’s urban center where there is less road and more vegetation. My maps also show high fire risk in areas where property values are higher, which is a little alarming. For example, to the north, I found properties costing upwards of $700,000 surrounded with materials that could easily burn. How do you plan to use this internship experience and your education going forward? CW: Because of SARP, all the kids at the high school I teach at think I’m “cool.” This should be the objective right? It is interesting how working for a widely known name can inspire students and make them believe they could also do something “crazy” like working for NASA. Besides bringing my experiences into the classroom, I’ve decided I want to pursue a PhD in Earth Sciences and one day become a professor. I’ve recently become interested in a hazards program at Oxford in the UK. I’ve certainly gained some self-confidence from getting to work for NASA, which has given me the desire to aim for a school like Oxford. There is a professor named Dr. Tasmin Mather at Oxford who has used the European Space Agency’s Sentinel-1 to study volcanoes for the benefit of international communities. I find this work to be interesting as a scientist and volunteer firefighter. I like the way she uses science to inform the public of hazardous threats. I think it would be really cool to use my experience at SARP as a way to set me apart when I apply, so that I could one day work with someone like Dr. Mather. Left to right: Chan Oh and Corey Walker. Chan was Corey’s roommate during college. Is there anyone else you’d like to recognize that has helped along your journey? CW: I want to recognize and thank my family who have invested their time, resources and love into my success. I also had a number of teachers and mentors who went out of their way to push me out of my comfort zone. Lastly, I want to thank my wife Emily, who sacrificed time that could be spent together so that I could do science in California. Thank you all. My name is Arie and I am a 21-year-old student at the University of Denver studying environmental science. 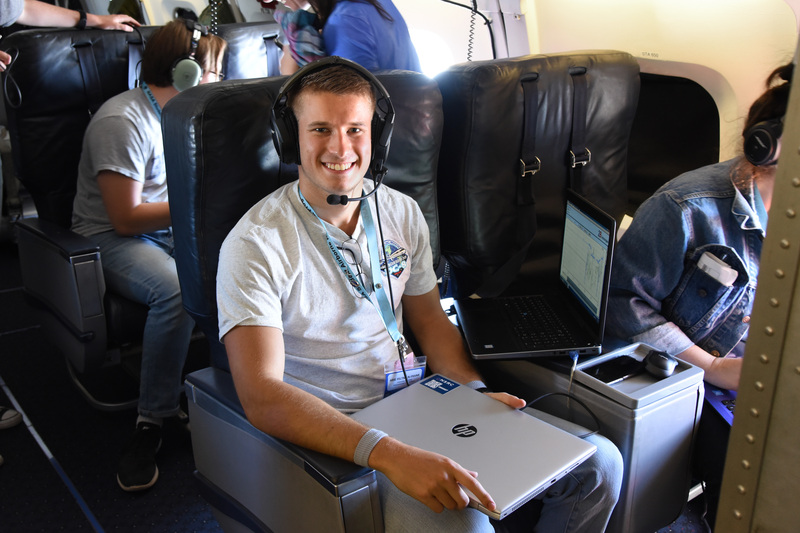 I am one of 28 students selected to participate in NASA’s Student Airborne Research Program, or SARP, an eight-week summer internship program that exposes undergraduate students to all aspects of airborne science campaigns, including data collection techniques and data analysis. Students from diverse STEM backgrounds were placed into four research groups—atmospheric chemistry, ocean remote sensing, land remote sensing, and whole air sampling—and they must complete and present a research project by the end of the summer. I grew up in Lincolnshire, Illinois, and since a young age I have been fascinated by the scientific processes that influence our planet. I believe that every human has the right to live a meaningful and purposeful life predicated on the existence of certain universal guarantees, such as clean air to breathe, safe food and water to eat and drink, and preserved natural areas. Those values align with SARP and almost all other NASA Earth Science campaigns, as their main objective is to collect accurate and high-quality data about the land, ocean, and atmospheric properties of Earth to understand how our world is changing. For this campaign, we were seated in NASA’s DC-8 flying laboratory, a unique plane with scientific instruments protruding from the windows. NASA’s DC-8 is not like any traditional commercial airline flight. 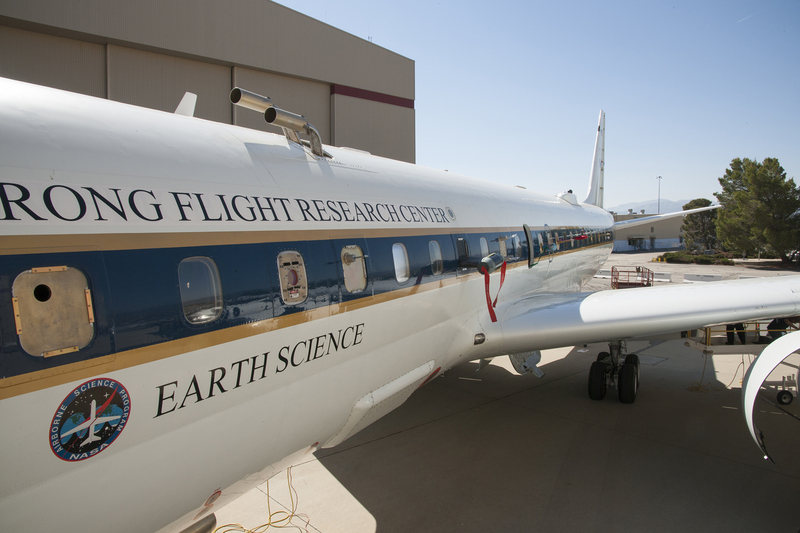 It was once a commercial airliner but was repurposed by NASA’s Earth Science Division and is now one of the best research aircraft in the world for conducting airborne science. Prior to my flight, the aircraft completed flights for NASA’s Atmospheric Tomography Mission (ATom), an around-the-world airborne science campaign dedicated to studying the impact of human-produced air pollution on greenhouse gases and on chemically reactive gases in the atmosphere. 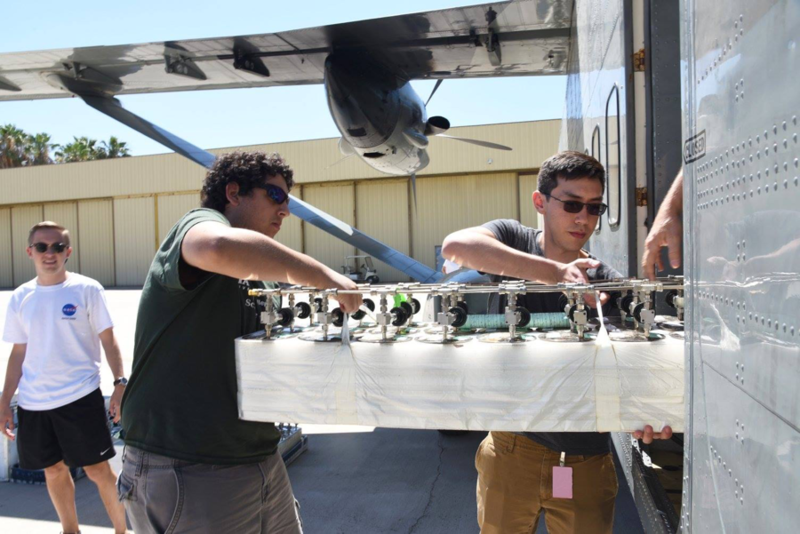 On this particular flight, we had instruments that measured the presence and relative concentrations of important atmospheric gases over regions in southern and central California, including the San Joaquin Valley. I could hear the faint crescendo of the aircraft’s engine and full-blast air conditioning system through my noise-canceling headphones. The scientists, flight engineers, and pilot talked over the on-board communication system. I listened intently to the scientists as they updated the crew on their instruments. The aircraft flight path and maneuvers depend on the goals of a particular scientific mission. 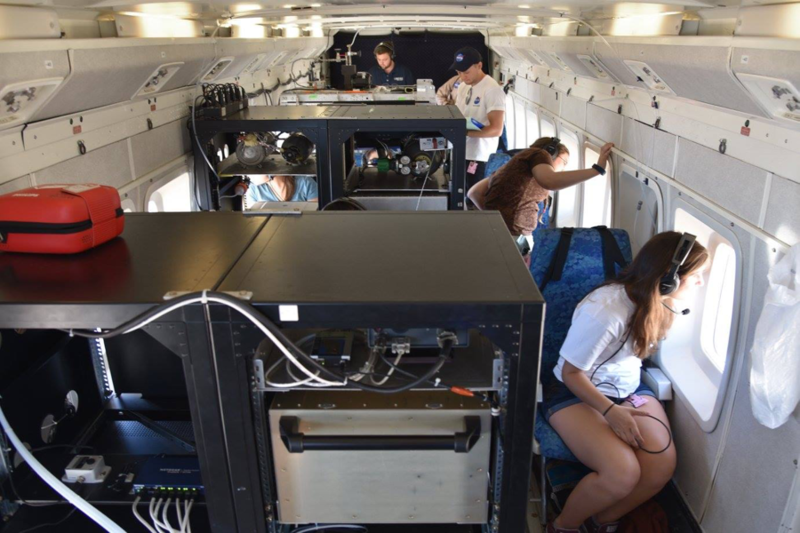 On this six-hour flight, we undertook spirals, loops, and Meteorological Measurement System (MMS) maneuvers, which are important for understanding the aerodynamics of the aircraft and its effects on measurements such as pressure, winds, and air flow. We also flew in turbulent conditions at various elevations and over diverse environmental gradients. That being said, it may come as no surprise that my DC-8 flight was as turbulent as it was long; I actually ended up getting pretty motion sick on the mission. Getting sick is a sacrifice some make to collect the necessary data. Despite not feeling well, I was surrounded by passionate students, scientists, engineers, and flight specialists all cumulatively working to advance one of NASA’s core missions: to understand and protect our home planet. I am excited to see all of the diverse and interesting projects that SARP 2018 will embark and present on at the end of the summer. I couldn’t ask to be in a better place or time here at NASA working with and being mentored by some of the best minds in the field. 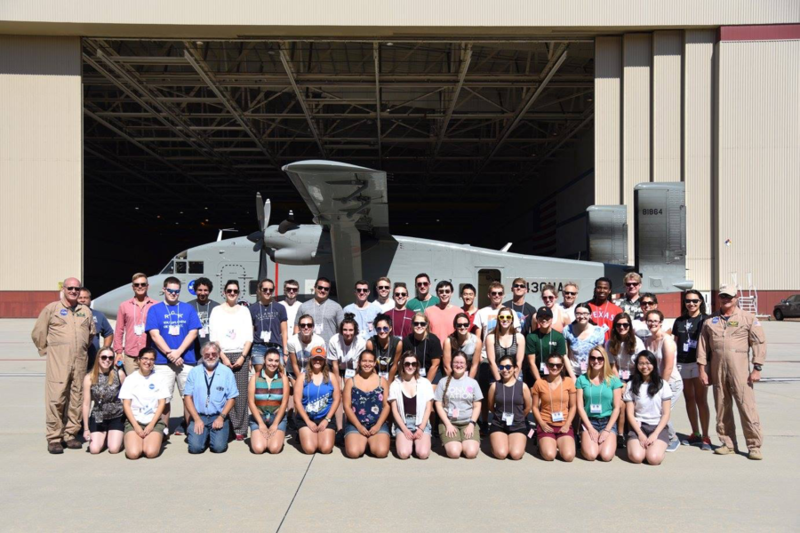 Thirty-two undergraduates from across the country had the experience of a lifetime flying on the NASA C-23 Sherpa and UC-12B King Air laboratories as part of the NASA Student Airborne Research Program (SARP) summer internship. One student, Madison Lichak, a biology major from Barnard College in New York, shares her flight experiences. It is stifling hot inside the aircraft, and I fidget nervously in my seat. A towering metal rack of scientific instruments stands before me, blocking my view toward the front of the plane, close enough that my knees are almost pressed against it. Motion sickness bags, tucked inside their cheerful blue paper wrappers, lie littered across an unused shelf. I try to breathe normally. I have taken many flights in my life, but the flight today is going to be unlike anything I have ever experienced. The plane I am on, NASA’s C-23 Sherpa, is not your normal commercial aircraft. An old army cargo plane outfitted to carry scientific instruments, the Sherpa reminds me of a bumblebee; with its tiny wings, you have to marvel at the fact that it can even stay up in the air. Loveably ugly and swamp green, the Sherpa is our laboratory for the next two and a half hours. As part of the Student Airborne Research Program (SARP), I, along with 31 other students from across the country, have the unique opportunity to work with NASA scientists to examine Earth from the air. 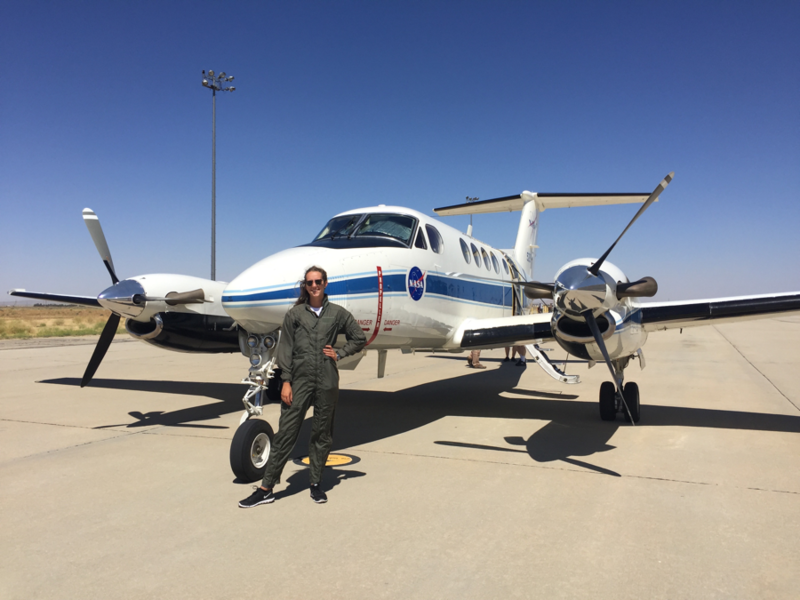 The previous day, while other students flew in the Sherpa over Los Angeles, I donned a flight suit and flew aboard NASA Langley’s UC-12B with the Geostationary Trace Gas and Aerosol Sensor Optimization (GeoTASO) instrument. It was a thoroughly pleasant, if somewhat cramped, flight at 20,000 feet. Throughout the flight we monitored the instrument as it made measurements of the atmospheric gases below us. However, on the Sherpa we will be taking physical samples of the air, so we need to fly right through the air we want to collect. This means we will be flying at an average height of 1,000 feet above the ground. As the last flight of the day, the hot air will have had plenty of time to become uneven, making for a very turbulent ride. The previous day’s final flight had been so bumpy that several students became sick, and I stare at the blue motion sickness bags in front of me with a mixture of trepidation and relief. Luckily, there isn’t much time for me to be nervous, as the Sherpa is only on the ground for a few minutes between flights. It’s almost 100 degrees Fahrenheit outside on the runway at NASA’s Armstrong Flight Research Center in Palmdale, California, and the longer the non-airconditioned plane sits on the ground, the hotter it gets inside and the greater the chance that the instruments will overheat. The turnover between flights has to be quick, so I scurry toward my seat where I begin to sweat nervously as other students and scientists remove used air collection canisters and tubes, affectionately known as “snakes” (due to the way the metal tubing snakes through them), and load new ones onto the plane. Once the transition is complete, the pilots start the engines, and because the Sherpa isn’t insulated, the noise is deafening. I quickly put my noise-cancelling headset on, just in time to hear the pilots ask if we’re ready for takeoff. I only have time for one more forlorn look at the blue motion sickness bags before we’re up in the air and I begin to relax. The air isn’t as hot and stagnant up here, and the turbulence isn’t that bad. The whole air sampling group gets up to begin taking air samples, and next to me the air quality monitoring research group turns on their instrument to begin collecting data. I sit back and watch as we fly over the massive redwoods of Sequoia National Park, a wildfire that billows smoke thousands of feet into the air, and oil fields so expansive they seem never-ending. As we spin in endless loops around the landscape, I marvel at all of the ways that scientific research seems to defy boundaries. Before I know it we are touching down at Armstrong. As the Sherpa makes its way toward the hangar, I revel in the fact that we just did science on an airplane, and I am so grateful to the scientists, pilots and staff that made this wonderful opportunity possible. 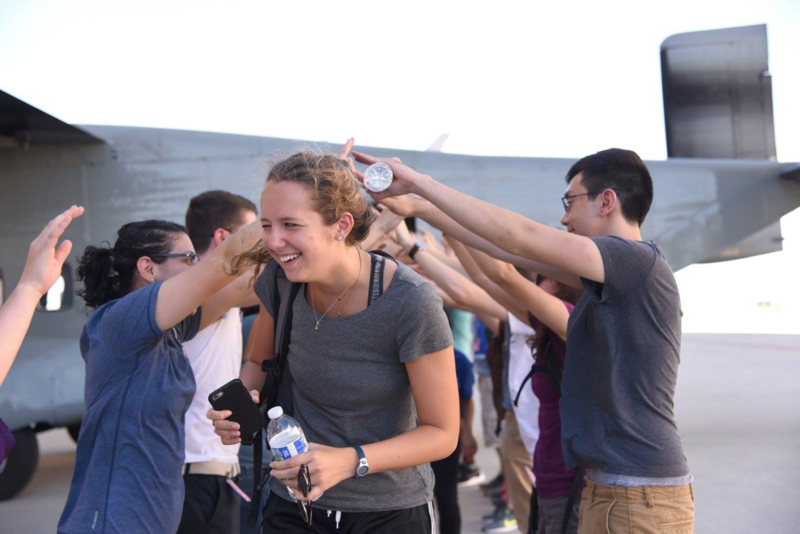 We gather up our things and shut down the instruments, opening the Sherpa’s rear door to the jubilant cries of our fellow scientists and students waiting on the ground, and see that they are holding up their hands above their heads to create a human tunnel. Running underneath their arms, I smile and yell, too, laughing and sharing in their joy. 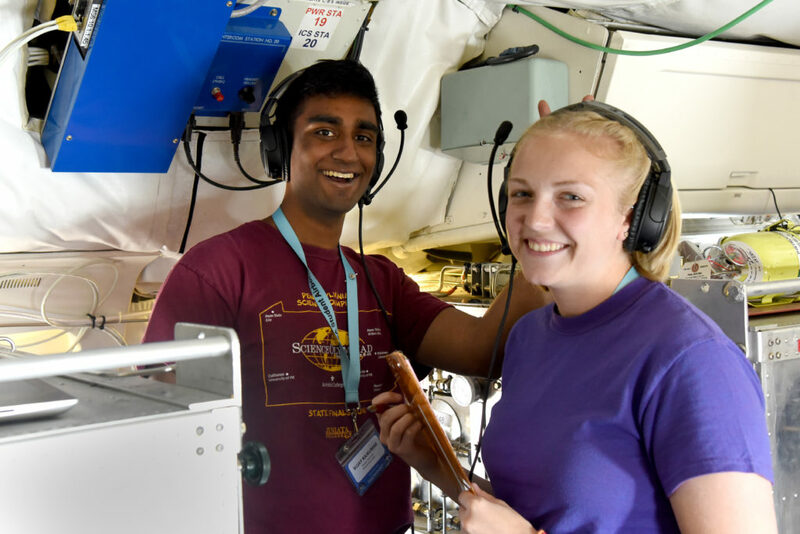 The Student Airborne Research Program (SARP) is now in its eighth summer. 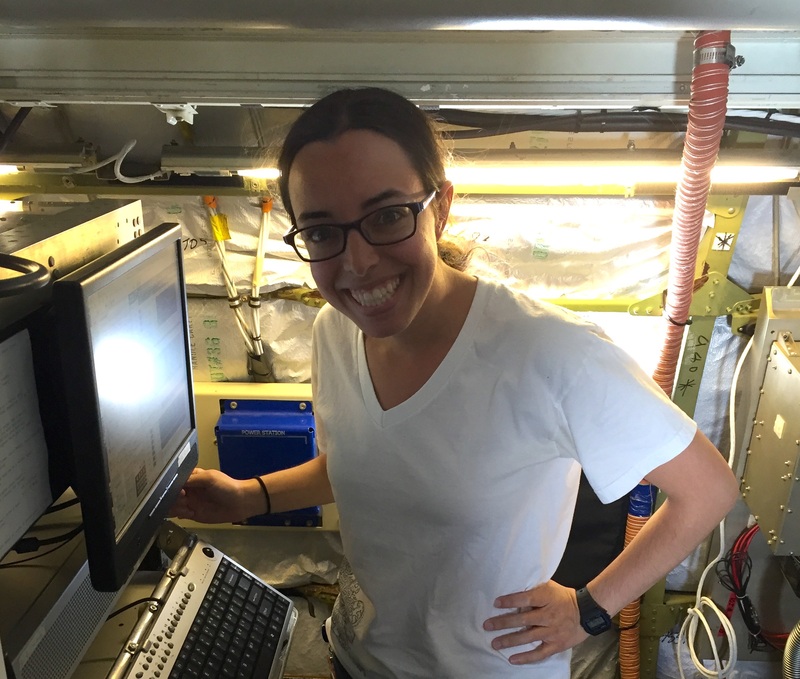 Many SARP alumni have gone on to get advanced degrees, others now work at NASA centers, national labs and universities, and some even participate on NASA Airborne Science Program research campaigns. Two SARP alumni, Benjamin Nault (2010) and Tamara Sparks (2012), were instrument scientists on board the DC-8 during the Korea U.S.-Air Quality mission in May. Ben is a postdoc at the University of Colorado, Boulder. He operated an instrument that measured the chemical composition of small particles in the atmosphere. 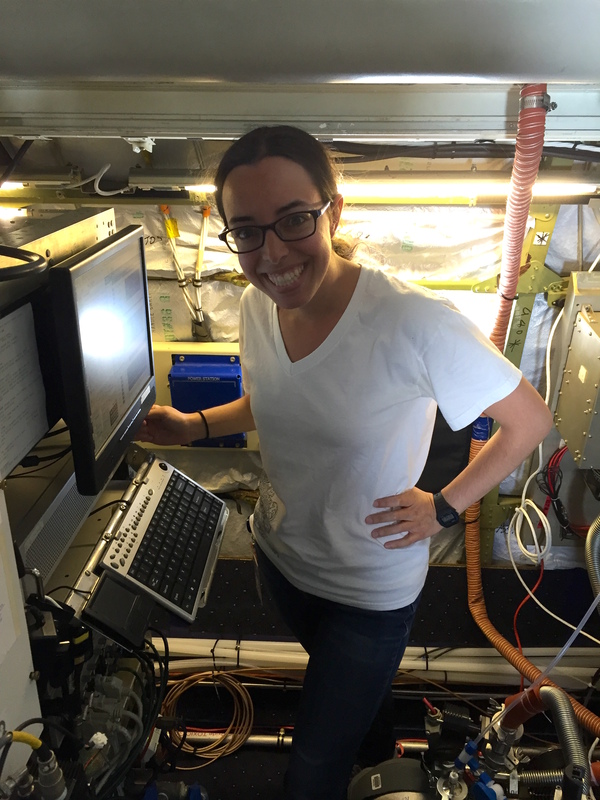 Tamara is a graduate student at the University of California, Berkeley, who operated an instrument that measures nitrogen dioxide, a molecule that is important for understanding pollution production rates and lifetimes. Here they describe how the SARP internship influenced their careers and their work on the KORUS-AQ mission. Ben: At first, I did not even think about being a scientist and my inclinations were more in the arts—chef, jazz musician, art teacher. Though I still cook as a source of relaxation every night, it was towards the end of 8th grade, after experiencing middle school science classes, that I started wanting to be a scientist. In particular, I was drawn to environmental science, especially due to all the activities I did outside, such as camping, hiking and fishing. 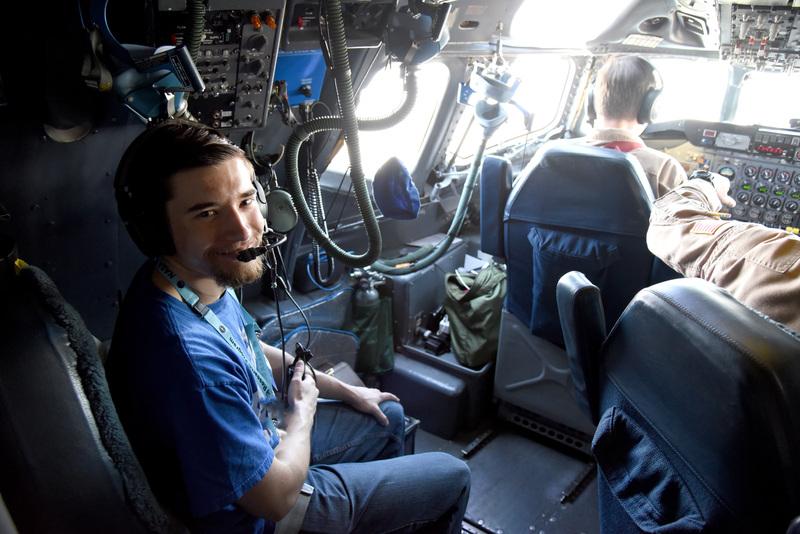 Ben Nault onboard the NASA DC-8 during the Korea U.S.-Air Quality mission. Tamara: There were a variety of things I wanted to be when I grew up, but the ones that come to mind are an astronaut or a marine biologist. Describe your educational background before SARP. Ben: I was completing my bachelor of science in chemistry at Purdue University. I decided to go to Purdue in order to earn a degree in the one of the core sciences prior to going to graduate school for my Ph.D. 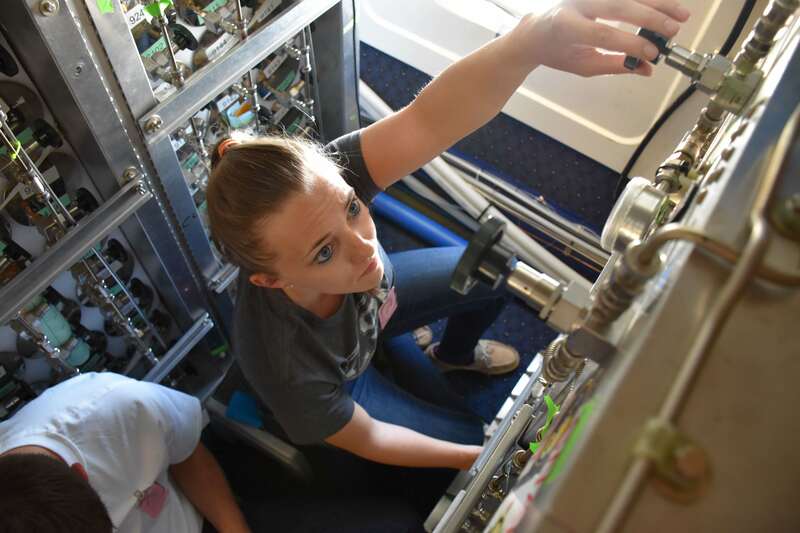 Originally, I wanted to do research in oceanography; however, Purdue provided undergraduate research opportunities with two groups looking at atmospheric chemistry problems. These opportunities allowed me to participate in research in Chile and a large science mission in northern Michigan. These opportunities made me extremely excited about atmospheric chemistry prior to applying to SARP. Tamara: Before SARP, I was attending Westmont College, where I got a B.S. in chemistry. I was looking for a way to apply my background in chemistry to studying the environment. I didn’t know that atmospheric chemistry was a field until I heard about SARP, and it immediately struck me as a perfect fit for my interests. Tamara Sparks at work over Korea on NASA’s DC-8 flying laboratory. What was an exciting part of the KORUS-AQ mission for you? 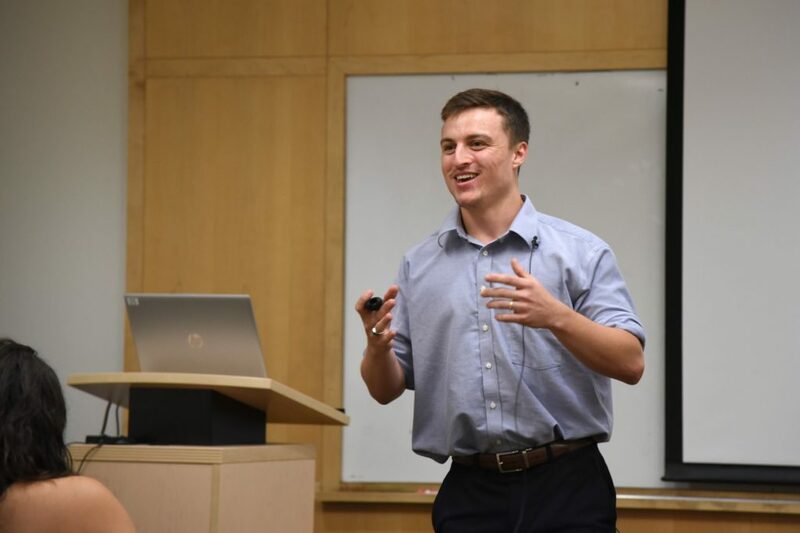 Ben: One aspect I love about my research is the opportunity to travel, and this mission took me to South Korea (awesome sauce!). Also, South Korea provides an excellent opportunity to investigate the impacts of local emissions on regional chemistry (and vice versa) as well as the impacts of these emissions on biogenic chemistry due to its geography. 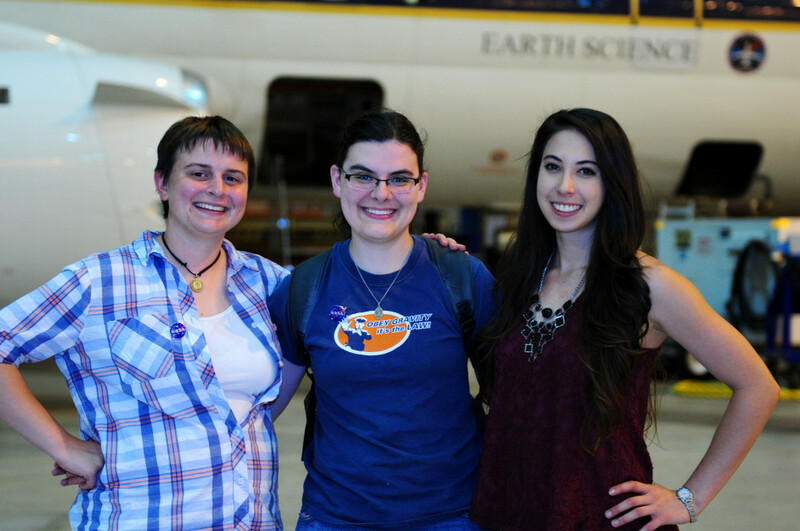 Tamara: I was excited to experience an international airborne science mission. It’s exciting that while doing science, I get to travel and experience new places. 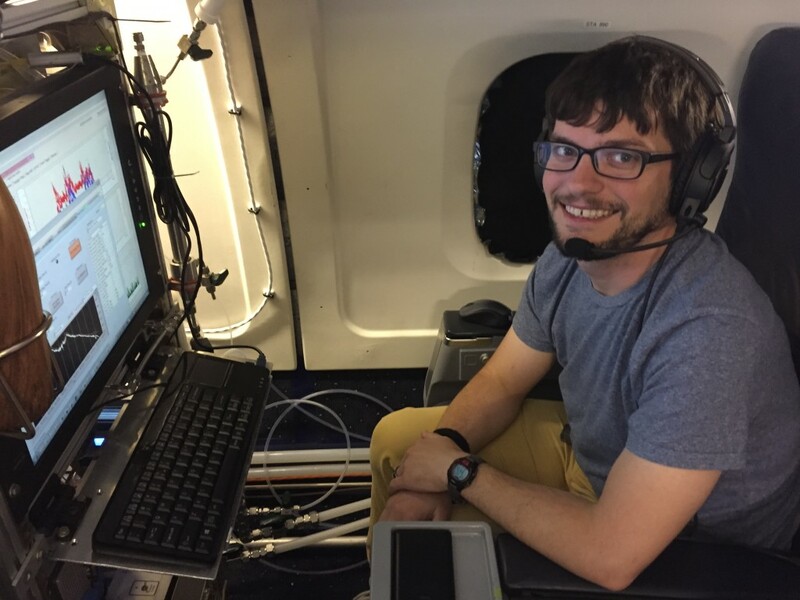 Ben: I plan on becoming a research professor at a university and continuing my investigation of atmospheric chemistry, including aspects that would need airborne research. Tamara: Graduate with a Ph.D.! I’m not certain yet what I will do after, although I plan to continue doing work related to the atmosphere. What would you tell an undergraduate who was thinking about applying for SARP? Ben: It is an awesome opportunity. 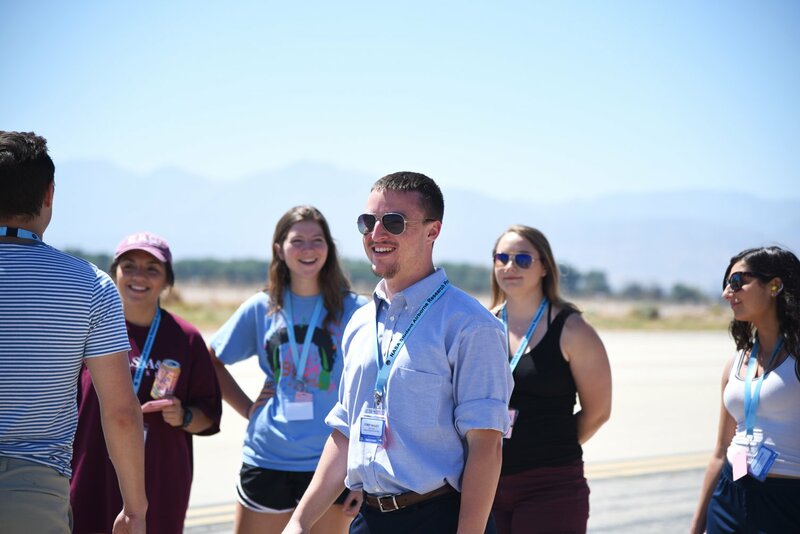 The program gives you an opportunity to see how airborne research is done and to see how the sciences are used to investigate tangible, real-world problems. Also, flying on a research airplane 1000 feet above ground level is something you will never forget. Try to do as many research and/or internship opportunities as possible prior to graduating to help you decide what you want to do after you graduate. Finally, enjoy this opportunity. It’s awesome!!!!! Tamara: Definitely apply! SARP was a great and unique experience. I learned so much and got to see firsthand how airborne science is done. The connections I made and knowledge I gained have been incredibly valuable. 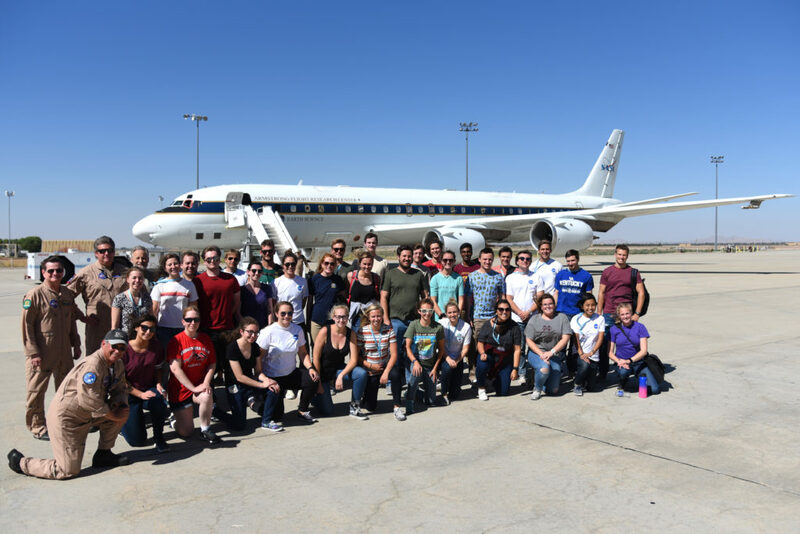 Thirty-two undergraduates from across the country had the experience of a lifetime last week flying on the NASA DC-8 laboratory as part of the NASA Student Airborne Research Program (SARP). 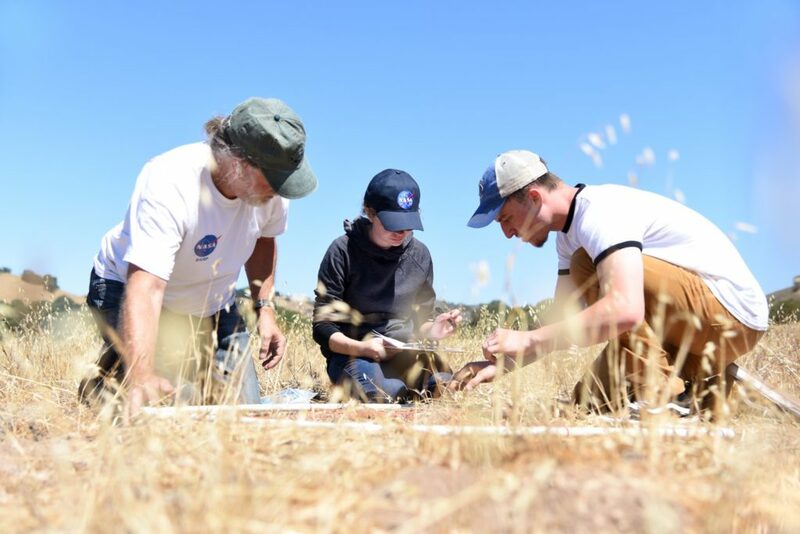 This hands-on internship gives students the opportunity to not only help scientists collect data but also creatively design their own research projects based on that data to address environmental issues that have global impact. 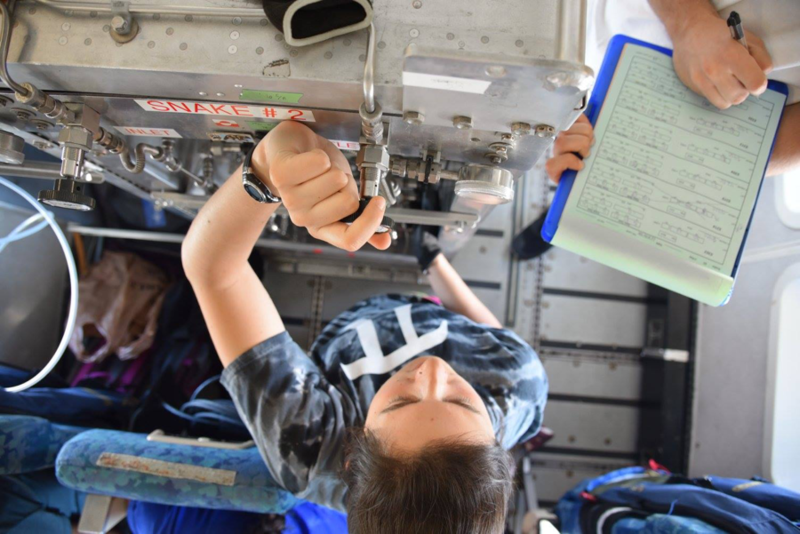 On June 17 and 18, the students flew on the DC-8, which had recently returned from research flights in the Republic of Korea as part of NASA’s Korea U.S.-Air Quality mission. 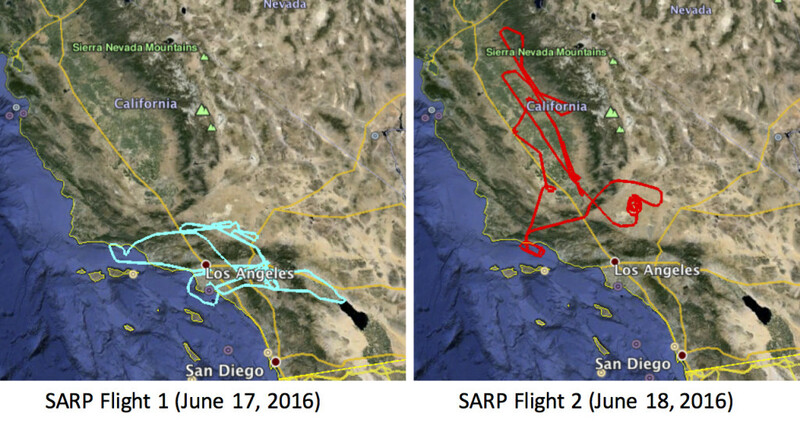 SARP participants observed and participated in flight planning and scientific data collection. Here, three of those students—Mariah Heck, Julia Lafond and Ariana Tribby—share their flight experiences. Julia is a geology major and biology minor from North Carolina State University. Mariah studies geophysics and geology at the University of Tulsa in Oklahoma. Ariana is a chemistry major at Pomona College in Claremont, California. The NASA DC-8 is not your typical commercial aircraft. The windows are filled with many sensors and air sampling devices that feed into instruments inside the plane. Usually, SARP flights have just a few instruments on board, but this time there were more than 20 because of the recent Korea U.S.-Air Quality mission (KORUS-AQ). 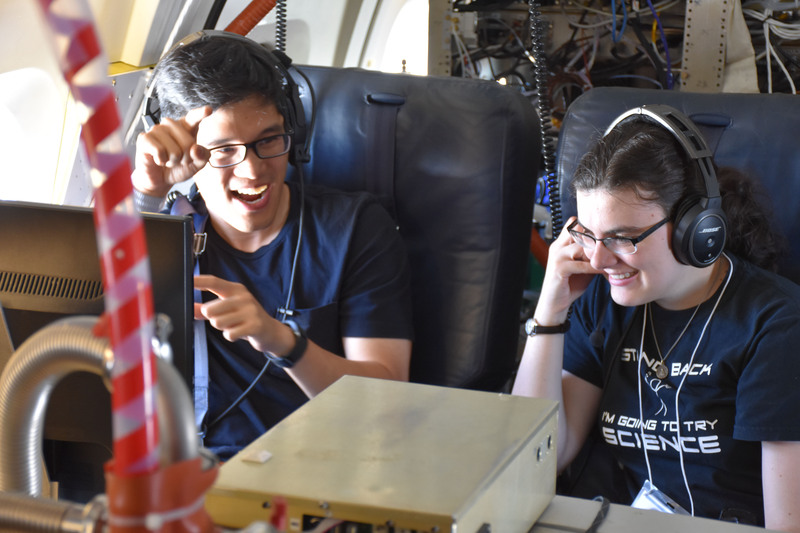 We wandered around the plane during flight to learn about not only the equipment on board but also how scientists work together on missions. Seeing the data-gathering process in action was incredible. While we were flying, the scientists announced their findings over headsets. They would often ask each other about the levels of specific compounds they were measuring, because results from each instrument comprised a piece of the entire puzzle of chemical reactions taking place in the atmosphere. It demonstrated that no scientific research is truly isolated—collaboration is key. One of the instruments, the Airborne Tropospheric Hydrogen Oxides Sensor (ATHOS), required adjustments below deck to allow the flow of several gases into the sensor above. 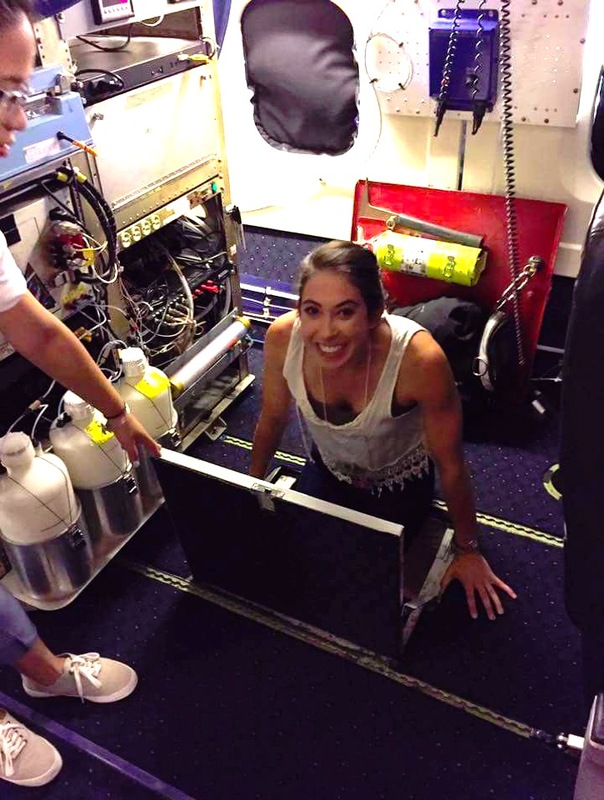 The scientist operating this instrument, Alexandra Brosius, gladly took students into the cargo area to demonstrate how to adjust gas flow inlets. It was extremely exciting to get into the pit, all while fighting to keep our balance because of all of the bumps and movement caused by the DC-8 flying through turbulent winds. The whole air sampling team was the busiest student group. They took samples of the outside air by filling vacuum cylinders every five minutes throughout the duration of the flight. They took samples more frequently at specific locations, such as when the aircraft flew over oil drilling fields or during missed approaches. Careful sampling during these events is essential for examining harmful emissions at their source. Going into the flights, we were both nervous and excited, as we were thoroughly warned that flying would consist of many spirals and missed approaches at area airports in order to collect data closer to the ground. A missed approach means approaching the runway like you are going to land, but then pulling back up. These maneuvers would also involve a lot of turbulence, and the high temperatures meant the plane would be uncomfortably warm—all factors that contribute to airsickness. As planned, we made several missed approaches, and because most of the flight took place in the boundary layer (approximately 1000 feet above ground), it was a bumpy flight overall. The maneuvers and low flying made seven people queasy. During parts of the flight, we could see smoke through the window. The Sherpa brush fire outside Santa Barbara was in full swing that weekend, and we could see how it directly influenced the chemistry of the atmosphere. A time-lapse video of the NASA DC-8 sampling haze from a wildfire near Santa Barbara, CA on June 18, 2016 during a SARP flight. 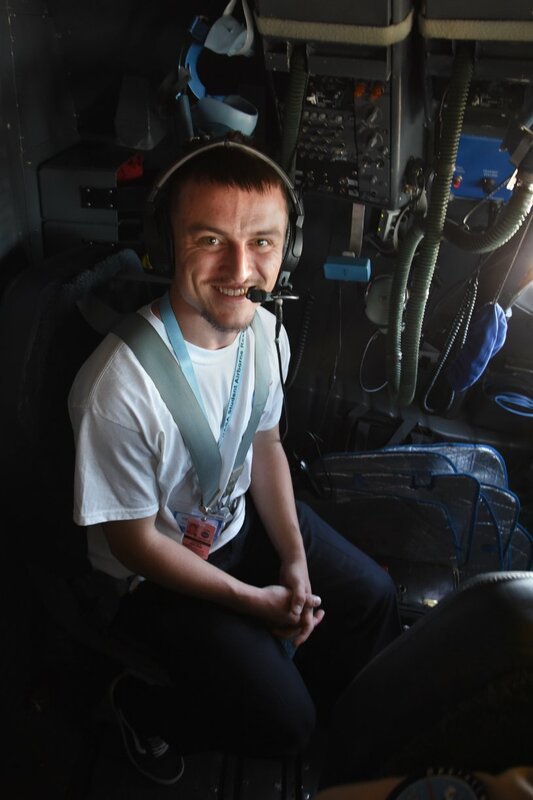 Despite the motion sickness, heat and tight space, this was an experience of a lifetime and we were very honored and fortunate to work with such incredible, accomplished scientists, engineers and pilots!